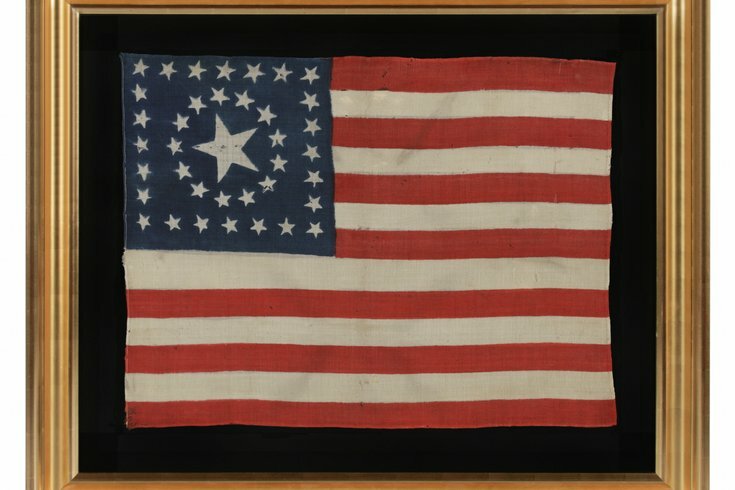 One of many antique American Flags that will be displayed at the Philadelphia Antiques and Art Show. The collection "Secret Treasures" features objects from dealers' personal collections that rarely are shared with the public. The 2016 Philadelphia Antiques and Art Show will be held at the Navy Yard over the weekend of Friday, April 15. At the event, there will be a special exhibit, "Secret Treasures," which will feature antiques on loan from dealers' personal collections that are not usually exhibited publicly. Antique flags are one category attendees can expect to see. View a flag made for the 100-year anniversary of American independence that used stars to create "1776-1876" in the left-hand corner. Another flag that will be on display is an early variant of Philadelphia's state flag, dating to the period of 1870-1876. Many antiques will have local ties, but the entire collection is a mix of periods and styles from across the world. Designers, curators and authors will also host panel discussions throughout the event, which is presented by The Haverford Trust Company to raise money for Penn Medicine. On Friday and Saturday, the show will be open from 11 a.m. to 8 p.m. but will close at 5 p.m. on Sunday. Tickets for general admission begin at $18. Guided tours of the exhibitors’ booths will be available with reservations from 10-11 a.m. Tickets are $25 and include general admission. A cafe and full bar will be available to guests at the event. S. Broad St. and Intrepid Ave.